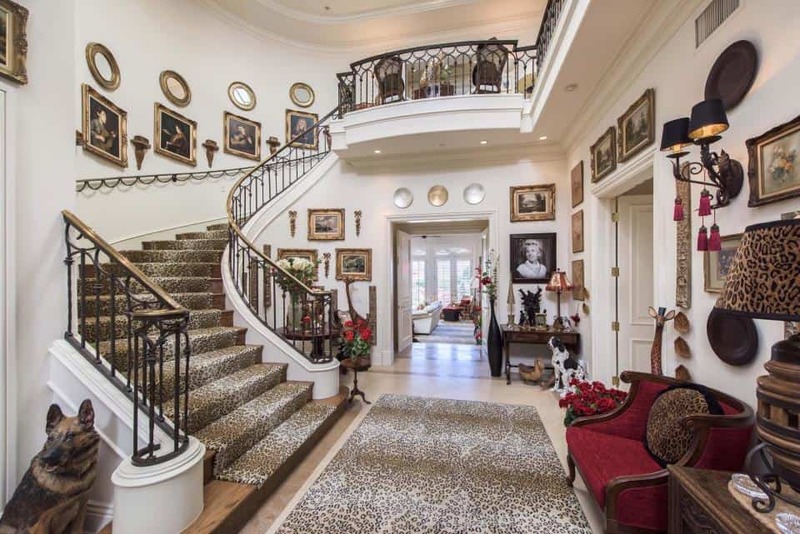 Globally famous Welsh crooner Sir Tom Jones has decided to sell his home , a lavish £6.45m mansion; including over half an acre of land with incredible views over Los Angeles. The Welsh expat has lived there just short of 20 years. 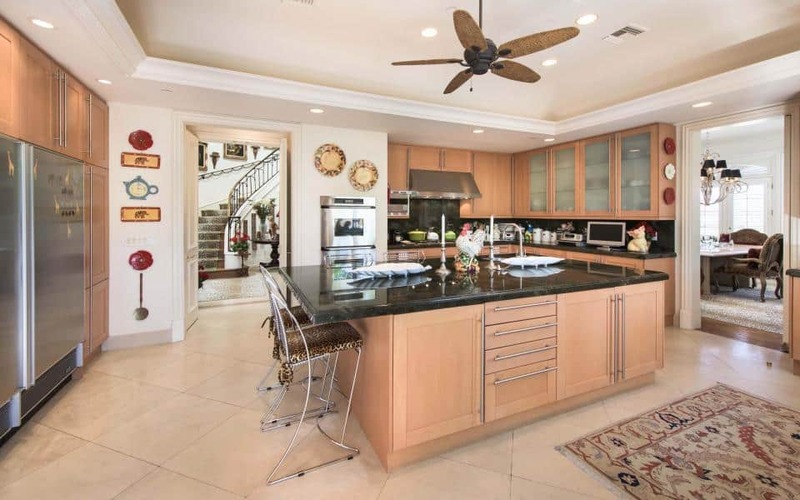 The 8,146 sq ft Mediterranean-style contemporary villa has 5 bedrooms and 7 bathrooms. It’s located in the private community of Mulholland Estates, Beverly Hills. This is a popular neighbourhood for celebrities; not least as it offers security gates and high hedges to shield shy stars. The big-voiced Welshman bought it in 1998 for £2,136,960. Apparently, he doesn’t just like to ask “What’s New Pussycat?”. Sir Tom also leans towards feline décor, as much of the splendid interior and furnishing feature leopard prints. 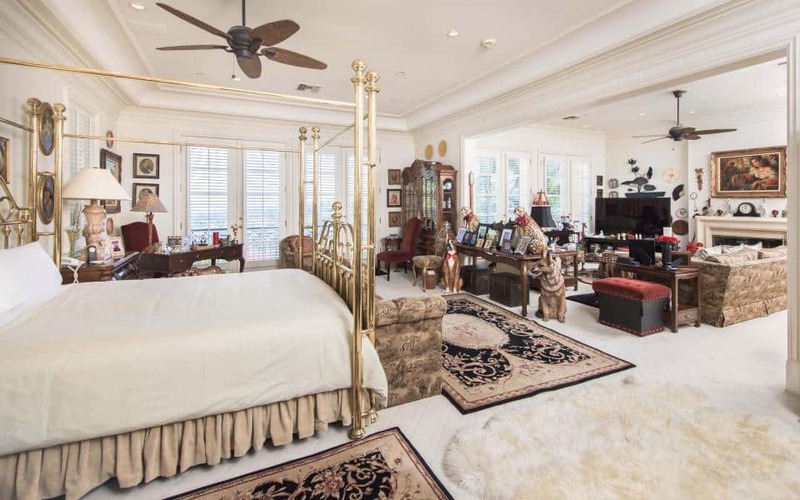 There are also abundant other animal and tribal influences, plus a sprinkling of gold of course; including an opulent golden four poster bed in the master suite. It’s “not unusual” to find Sir Tom Jones talking about his beloved home country as he has a deep affection for Wales. So, it would be intriguing to know if this move will mean relocating one of his most nostalgic reminders of his roots. There is currently no news on whether the sale price of his home in LA includes the fully functional red telephone box that he had installed in the grounds, after bringing it over from his hometown of Pontypridd. It was also a reminder of his late wife, Linda. He added: “It was from a call made in that very box that I learned I had become a father and once when it rang in the States I found out I was a grandfather,” Jones said. But what if you are selling a rather humbler property in Sir Tom’s home country of Wales? Can you expect such a healthy profit? Well, the good news is that property prices back in Wales have shown a healthy climb. The average house price is now higher than 2007; which was the peak before the UK financial crisis hit the property market hard. A major building society has reported that average house prices in Wales are now £174,319. This compares favourably with the pre-slump high of £170,142 in October of 2007. At the lowest point some eight years ago, the struggling property market in Wales meant average house prices were as low as £150,000. 2017 is expected to bring more steady growth in the Welsh housing market. This is particularly as evidence suggests that a growing number of people are migrating to Wales to take advantage of relatively affordable property prices. For example, the expensive housing market in places such as Bristol is putting the spotlight on South Wales in particular. As there are plans to cut the costs of the tolls on the Severn bridge crossings; this is a trend that’s likely to accelerate. Not that the country is all about bargains for property hunters. The most valuable house to sell in Wales in February 2017 was a seven-bedroom detached property in the Lisvane area; which sold for £1.315m. Still not the same dizzy heights as Sir Tom’s pad in LA, but it illustrates how diverse the Welsh property market is. So, does that mean selling a house in Wales will be easy? After all, the country offers Wales over 1,680 miles of coastline and rugged mountain ranges that are far more beautiful than any celebrity hillside in Beverly Hills. But without the celebrity kudos, the swimming pool, and year-round sunshine; selling property in Wales may not be as easy as in LA. Of course, in some Welsh property hotspots, it is possible to sell a house in 20-42 days according to one survey. But there are still places where homes can stick with some areas reporting an average of 270 days for houses to sell. And even when you find a buyer, the process of selling a property in Wales can be dragged out for weeks. Usually while all the legal side and surveys are completed. Let’s be honest, it can be a long, painful process. Especially as you will be living in the house you are selling; unless you have other places to live like Sir Tom! Fortunately, there are cash buyers waiting. You don’t need the rigmarole of a glossy brochure and internet campaign like Sir Tom Jones is using in LA to sell your home in Wales. You can sell fast today.